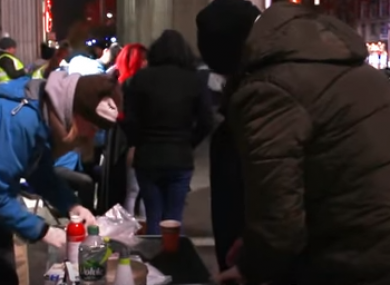 Is handing out free food and clothes to homeless people really the best way to help them? A large number of groups feed and clothes homeless people in Ireland – but are they really helping? HOMELESSNESS IN IRELAND has increased significantly over the past five years. Adult homelessness – ie, the number of people either sleeping rough on the streets or staying in state-funded emergency accommodation – had doubled in just three years. Child homelessness had quadrupled. Latest figures show that there were 8,857 homeless people living in state-funded emergency accommodation in Ireland in November. As a response to this, a large number of community outreach groups have sprung up in cities and towns across Ireland, with the majority of them located in bigger cities like Cork and Dublin. These groups offer food and clothes to people who may be sleeping rough or are without a home. In Dublin, a large number of different groups offer cooked meals at various nights during the week. Often, large numbers of people congregate at the GPO on O’Connell Street or the Central Bank for substantial meals on different evenings. On top of this, other groups walk through the city centre offering out tea, coffee, sandwiches and other foods. On any night in a week, there could be five or six separate organisations giving out food and provisions. This is separate again to a number of government-funded organisation who also hand out food, clothes and give support to homeless people. On top of these efforts, there are barbers who give out free haircuts to people, vans that drive around providing support, and even a dentist who fits dentures for homeless people outside the GPO. These concerted outreach efforts have grown in response to the worsening homelessness crisis, as people saw others in need and made plans to try to help them. But recent research studies have questioned whether these efforts are actually helpful and whether they could in fact be harmful for homeless people. Dr Beth Watts – a senior research fellow at Heriot Watt University – has written a number of research papers on the subject of responses and charity towards homeless people. “If you’re interested in making the most difference, you might say there’s an obligation not just to volunteer, not just to do anything but to do the thing that helps the most,” Watts told TheJournal.ie. In her research, Watts argues that it may not be simply good enough to want to help a person who is homeless or rough sleeping, but that instead people who want to assist homeless people should look into how their efforts can help to get them out of homelessness. “Rough sleeping is extremely damaging to the individuals involved,” she said. “It’s also something that we can understand. We can understand what causes it, that people struggle to escape it. “And we can understand the kind of interventions that work to actually help the people off the street, not just feed them and keep them warm while they’re on the street. If we know what can work, if we know what leads to the kinds of consequences we want and everyone wants, then are we not obliged to push for those kind of responses? Watts said that debates were needed around the effectiveness of soup runs and community outreach groups and how helpful they really are. Watts makes it clear that she is not condemning soup runs and the efforts of the people involved in them, but rather that a debate needs to be had. “What I definitely wouldn’t want to be represented as saying is agreeing the very simplistic line that soup kitchens are obviously really unhelpful and obviously play no useful role here,” she said. I think these are questions that we don’t know the answer to, that we need to try and find the answer to. In a paper written by Watts and Cameron Parsell, published in the European Journal of Homelessness - the pair look into a recent development around homelessness outreach in Australia. Two young men started a mobile laundry service in 2014, allowing homeless people to wash their clothes for free. Soon, the Orange Sky Laundry service was rolled out across six cities in Australia and had close to 500 volunteers. It also received hundreds of thousands of Australian dollars worth of government funding as well as money from volunteer and philanthropic donations. (The pair were also named Young Australians of the Year in 2016). In the paper it is argued that not only does a service like this not help people out of homelessness, it may also be harmful to efforts to remove people from homelessness. Speaking to TheJournal.ie, Watts expands on this point. She said one thing to keep in mind when considering whether an act could be harmful was the opportunity cost involved. “The effort and the resources involved in doing that could be expended elsewhere, on other approaches,” she said. “The general sense you get that the only things that are required here are good intentions and maybe some innovative ideas – that this is all unquestionably good, unquestionably morally praiseworthy and unquestionably helps people who are homeless. I just think that is not sufficient. Secondly, she said it was important to consider whether improving someone’s situation in homelessness was the best way to help them. “Is there not a poverty of aspiration involved in just trying to make people warmer or fill their bellies, when actually what we should be trying to do is something more ambitious?” she said. Again, Watts said she is not making a determination on whether these approaches were harmful, but rather that proper debate and research was needed. “Now if you give a choice with leaving someone on the street and having them full up and warm or not, well then obviously the whole part of me wants them to be more comfortable,” she said. But I think there’s real danger when that is seen as the right solution and anything more ambitious… is kind of pushed into the background by those voluntary, community-led responses. She said that finally, the idea that all people could do with their efforts was to help keep people fed and warm could also be harmful to actually ending homelessness. “It’s not ambitious enough, and we can do more. We know exactly the kind of responses that get people off the street and keep them off the streets,” she said. So I think anything that gives over that idea to the general public, or lets public authorities get away with the idea that all we need to do are those kind of soup and scarf type responses. I think that can be detrimental. In the paper, Watts talks about the idea of “effective altruism”. This means that people should look towards not just giving to a good cause or wanting to help, but instead work towards an actual solution to the problem. Most recently in Ireland, the community organisations that have sprung up have done so in response to an ever-worsening housing and homelessness crisis. Last year saw €109 million spent on homelessness services by government, It also saw increasing numbers of homeless people every month. Partially state-funded non-governmental organisations (like Focus Ireland, Merchant’s Quay Ireland, the Simon Community and the Peter McVerry Trust) are engaged in serious efforts to implement evidence-based methods to end homelessness. Meanwhile, many people – including the controversial chair of the Housing Agency, Conor Skeehan – have been critical of the funding given to homelessness charities and their efforts to solve the issue. It is in this climate that community outreach groups and services have grown and operated, and will likely continue to do so as homelessness gets worse. “I think people should go ahead, and if that’s what they want to do, to volunteer for soup runs and things,” said Watts. “But I would tell people to remember and bear in mind the structural context and level of difference of these things. To keep thinking and keep pushing the organisation you’re with and your local politicians to address the bigger question that will really make a difference. Read: FactCheck: Does Ireland really have a low rate of homelessness by international standards? Email “Is handing out free food and clothes to homeless people really the best way to help them?”. Feedback on “Is handing out free food and clothes to homeless people really the best way to help them?”.